The base of the bank is a vintage cigar box. 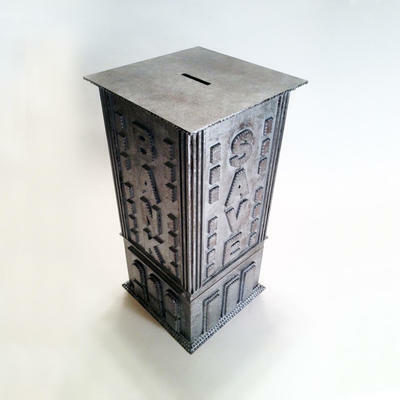 I built on to the base to create an architectural piece similar to the vintage cast metal banks of old. The front and back have the word "BANK" while the sides have the word "SAVE". The base holds coin wrappers while the top portion is used to save your paper money and coins. NO NEED to break in to this bank! The lid lifts off for easy access to your fortune. It is stained and then a series of metallic silver washes were applied. Approximately 150 hand-cut and carved pieces of wood were used in creating this one-of-a-kind work of art.